This is a photograph of Anna Townsend Quantic, who immigrated to the United States from England. She was born in Summersetshire, England, September 1, 1864. Anna left England and came to Riley County, Kansas, where she met and married Thomas G. Quantic. Their first home was in Keats, Kansas and they later moved to a farm south of Riley, Kansas. They had three children Hermina Mealina Quantic Harrison, Berton Townsend Quantic, and Madeline Susan Quantic Bohnenblust. 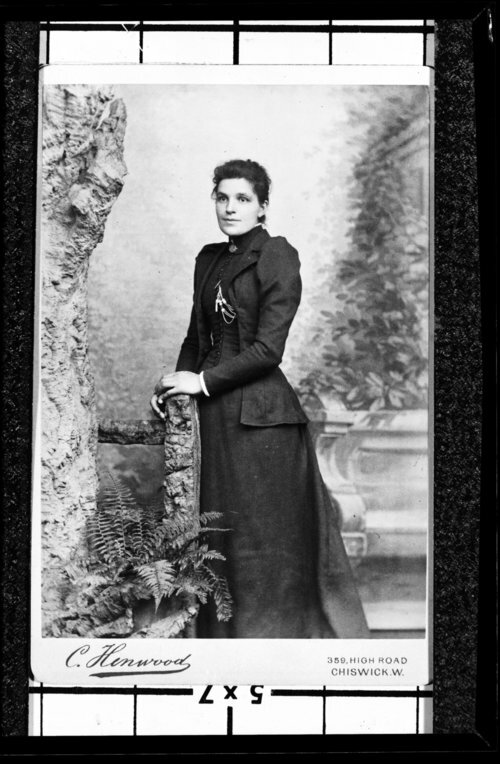 Anna was involved in the Ladies Aid Society and served as president of the organization. She was also a member of the Riley Neighborhood Club. Ann died April 10, 1930, and is buried at the Riley cemetery.